The Sinn long sleeve performance twill is designed to be a "no hassle" shirt - it's in 100% cotton, and is no stain, no wrinkle. This shirt is great for casual or business casual wear. It's treated to fight wrinkles and stains. Plus, it comes out of the dryer looking neatly pressed and ready to wear. With clean-finished seams, single chest pocket and buttondown collar, it has all the makings of your favorite dress shirts. Mock horn buttons. 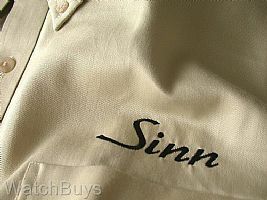 This shirt is khaki and is size XL (extra large), and features the Sinn logo stitched in black. This shirt is not eligible for return.